Hey spooky friend! If you have been looking for the perfect creepy Halloween eyeball recipe you have come to the right place! 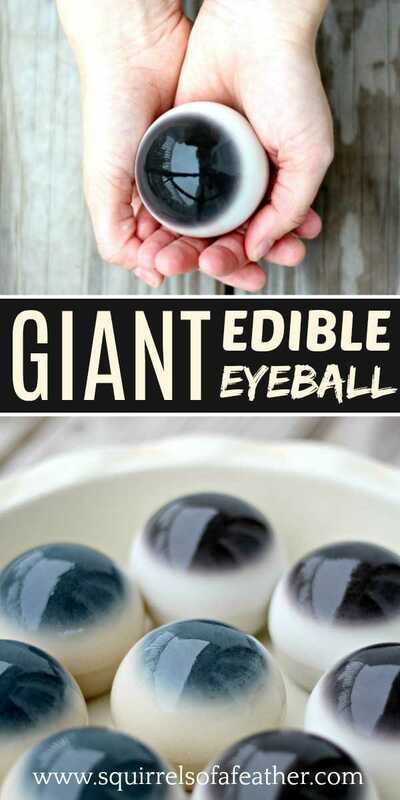 These giant edible eyeballs are delicious and gross at the same time. 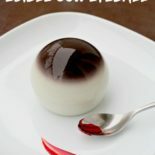 Read on to find out how to make edible eyeballs for Halloween! It’s time to go back, way back, to high school when you dissected cow eyeballs in Biology. 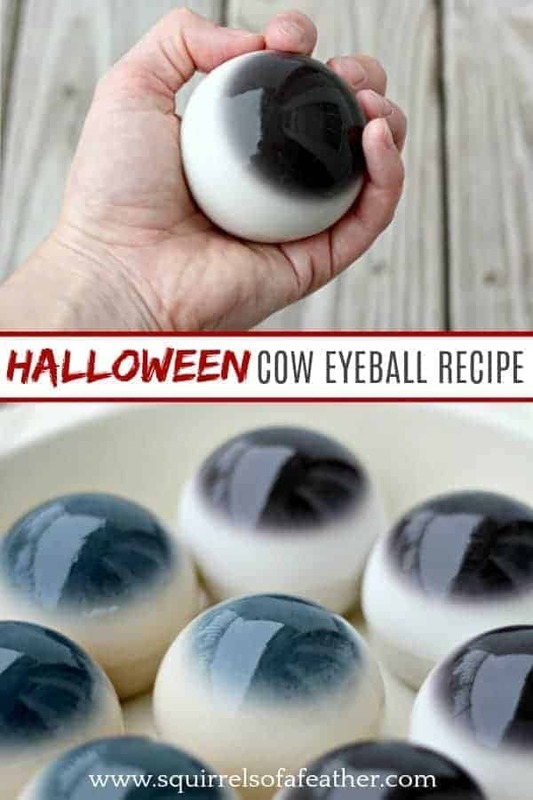 If you are making giant eyeballs, cow eyeballs are the only way to go! 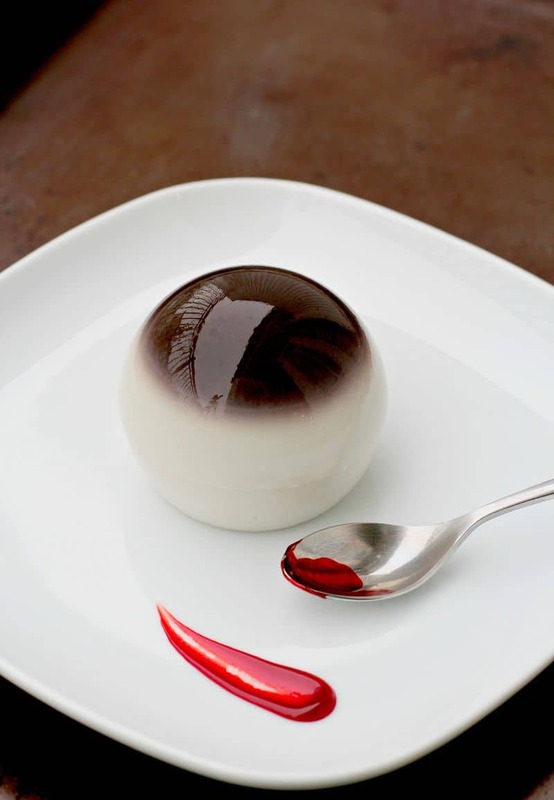 These Halloween eyeballs taste like a sweet, luxuriously rich coconut pudding! If you don’t like coconut, you can also substitute almond milk, but you will need to play with the sugar ratios and taste test while you are heating everything up. Why use agar agar for an eyeball recipe? We are going to be using agar agar powder to create our edible eyeballs. If you aren’t familiar with agar agar, it basically the plant-based equivalent of gelatin. It is made from seaweed, so it is okay for vegans and vegetarians to consume; it is also gluten-free! It is colorless, odorless, and pretty bland on its own, so you need to use either flavored liquids and/or sugars to liven up the flavor! If you don’t, you’ll be sorry, trust me. My love affair with agar agar started more than ten years ago. My college roommates were Taiwanese and Indonesian, so they introduced this McDonald’s-eating Indiana girl to all sorts of cool new foods I had never heard of…we wandered through Asian food stores like H-Mart and Mitsuwa in search of rare delicacies. Good times. 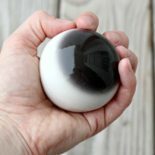 Agar agar is perfect for this giant eyeball recipe because it is rigid and holds up to a spherical mold well. The consistency is kind of like a very stiff pudding. I HIGHLY recommend you purchase the Telephone brand agar agar…avoid the Gold Coin brand agar agar at all costs. The first ingredient in that brand is sugar, and it won’t yield the same results as this recipe. If you want to get nice, sphere-like eyeballs, stick with the sphere mold brand I recommended. I have tried other sphere molds like this one and was really disappointed when they didn’t work at all! When you fill your mold nearly to the top with the desired liquid, you then take the black cap and slowly press it down on top of the mold. The silicone sides will displace the liquid upwards, and air will vent out from the small hole in the top! Nothing worse than trying to eat an eyeball and having it roll away, amirite? 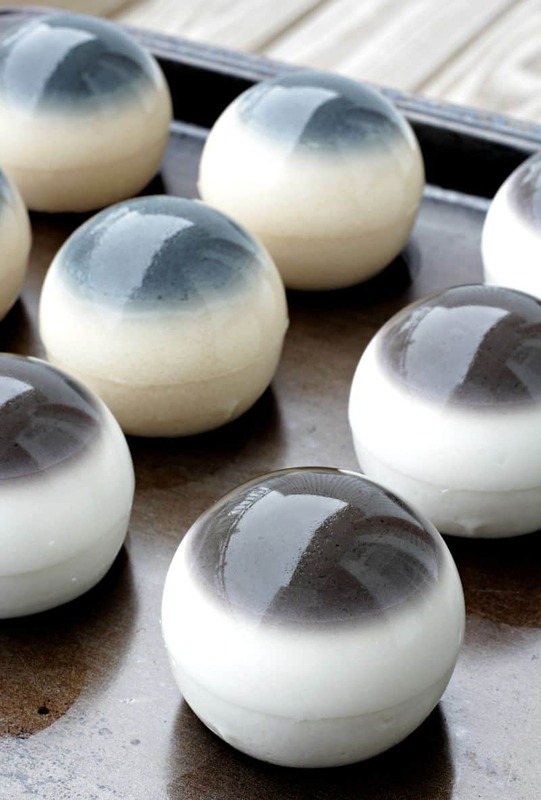 For this recipe to resemble cow eyeballs, we have to make our own black food coloring. You do this by combining equal parts red, green, and blue food coloring. I placed red, green, and blue food coloring in the bottom of a mixing cup, about the size of a pea for each color. You can see a slight differentiation in color between some of my eyeballs; different quantities in the color will result in slightly different colors. One batch turned out a little more on the blue side. After you heat up the coconut milk, water, sugar, and agar agar per the recipe below, you will remove 1/4 + 1/8 cup of the mixture and place it in the bowl with the food coloring, mixing it until it turns black. At that point, you want to quickly scoop out 1 tbsp at a time of the black agar agar mixture and carefully place it in the bottom of each mold, trying not to spill. Place in the fridge to cool for about 30 minutes; when it is firm to the touch, you can add the rest of the white coconut mixture to the molds until they are nearly full, leaving a small amount of space at the top. It’s ok if you spill a little, just use your finger to smoosh it down towards the center. You can see where one of my molds had a little bubble that popped. Place the lid on top of each of the molds and put in the fridge until cool. Give them several hours to cool completely. It helps if you have a cookie sheet to hold all of your molds and move them around all at once. Once they have cooled completely, to remove you can gently place your finger next to the eyeball and start carefully prying it out. It will slowly release its suction, and once it pulls out a little bit you can turn the mold upside-down to drop it into your hand. You can serve chilled or at room temperature (agar agar will still be solid at room temperature) but I find that it’s best chilled. I mean, who wants to eat lukewarm eyeballs? Now that’s really gross. 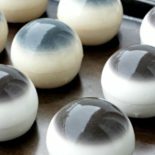 This recipe is for eight eyeballs; because you only have six molds, you will have to wait until the first lot is cooled before taking out and adding the last two. Or you could just buy extra sphere molds. Or just pour into a different mold to enjoy. If the agar agar mixture starts solidifying while you are cooling the first set, don’t worry! You can simply reheat the agar agar mixture in the pan and it will turn back into a liquid. Neat! I have seen some reviews that said this recipe wasn’t sweet enough. I recommend that you make sure to taste your eyeball mixture while it is still in liquid form. If it isn’t sweet enough when it’s a liquid, it won’t be any sweeter when it’s solid! Take a spoonful out and cool a bit so you don’t burn yourself when tasting it. If it isn’t sweet enough, add a little more sugar until you get the sweetness to where you want it! Then you can follow the rest of the steps as planned. Did you love this recipe for Halloween eyeballs? Make sure you leave a good review if you did! Any questions? Pop them below in the comment section and I will try to help out! Looking for the perfect Halloween eyeball recipe? This edible eyeball recipe is tasty and gross at the same time. The perfect spooky Halloween treat! Place a pea-sized amount of each red, green, and blue food coloring in the bottom of a small, heat-safe mixing bowl. Set aside. Remove 1/4 + 1/8 cup of the agar agar mixture and place into the bowl with the food coloring. Whisk until the mixture is black and place 1 tbsp each into the bottom of the six spherical molds (put them all on a cookie sheet for easy moving). Put all molds into the refrigerator to cool. After about 15-30 minutes, check and see if the black mixture has set. 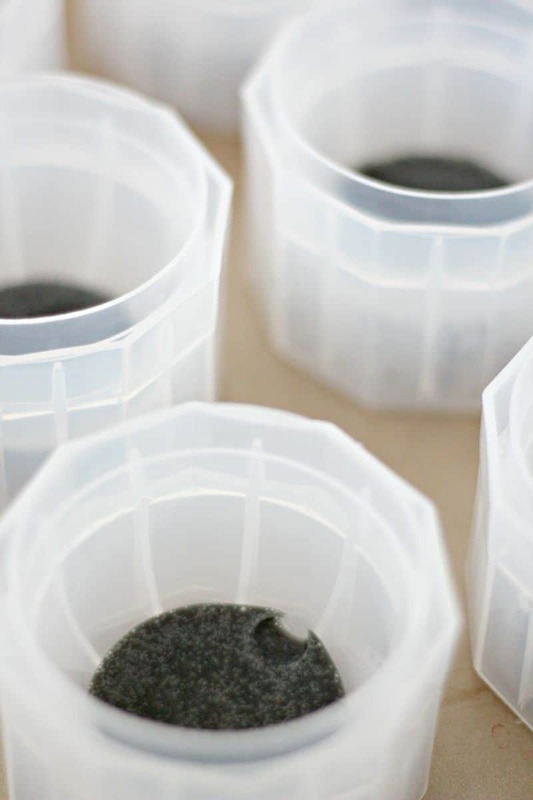 If it has, begin adding the rest of the white agar agar/coconut mixture on top of the black mixture evenly across the rest of the six molds, leaving a small amount of space at the top. (Note that if the mixture in the pan has started to solidify, you can reheat to make liquid again). Once all the molds have been filled, place the lids carefully on each mold and press down gently. Put back in the fridge. Allow to chill several hours until eyeballs are fully set. Repeat with the remaining mixture for two more eyeballs if desired. Remove and serve as desired. Thanks for telling me, Michelle! It said in the actual instructions but I added it to the ingredient list…it’s 4 tsp of agar agar, 1 tsp for every cup of liquid! Hi Marissa, I’m excited to make these. Can I use something more readily available than the agar agar if I’m not worried about it being vegan? Thanks! If your allergic to seaweed is there a substitute for agar agar? Hi April! If you are allergic to seaweed you could modify this recipe with uncolored gelatin instead of agar agar…I haven’t tried it myself, but it should work. Search Pinterest or Google for “Jell-O eyeballs” and modify that recipe using these flavors and colors! I will try and do a Jell-O version for Halloween 2019! Wow! I have never seen anything like this, so original and SPOOOOoooOoooky, Marissa! 🙂 Did I ever tell you that I almost named my daughter Marissa? I love your name. Thanks for sharing this! You are so talented and creative! I’m a big fan already. You’ve inspired and entertained me, as a reader and fellow blogger. These eyeballs are just awesome, and I’m reminded that my hubby has round molds to make ice cubs for scotch…perhaps I’ll surprise him with a giant EYEBALL in his scotch! Moo-hoo-hoo-ahh-ahh-ahhh (sinister laugh). A spooky buffet table sounds amazing! I would love to see pictures afterward, looking forward to it Debby! Love love love it!!! I liked to do fun things like this with my kids. Now my grand kids! Can’t wait to do this Halloween idea with them. I am sure the grandkids will love them! My kids sure did…thanks for checking out my recipe, Sue. That is absolutely genius! Pinning! Do they release without spraying the molds with cooking spray? I spray the molds when I make Jello Jigglers. I love coconut. These look so cool. Gayle, mine released great with no spray! I just very gently slid my finger in between the eyeball and the mold edge and pried it out very gently…it will start to pull away and then will fall out easily once you turn it upside down! Do you have a YouTube video of this recipe? I am not very good whennit comes to creative thing :(. Veronica, I don’t yet but I was thinking of doing a FB live and then sharing that video on YouTube and my post later! Follow my FB page and if I do one you should be able to see it! I will say that agar agar is VERY forgiving…if you mess up and it gets solid, you can always reheat it for a do-over. Best of luck! Hi, what does this taste like and texture? Is it like pudding or jello? Thanks. Hi Francisca, the taste is a lovely sweet and rich coconut flavor. If you have ever had Thai sticky rice, that’s the kind of flavor. The texture is like a very stiff pudding. If you reduce the amount of agar agar, it could be softer but you risk the eyeball not holding their shape as well. It is basically like an Asian fruit jelly if you are familiar with those. Hope this helps! Can’t wait to send this in for my 5th grade son’s Halloween treat!!! Woohoo awesome Selena, I hope he loves it! I am making them tomorrow! Can’t wait. Going to an adult Halloween get-together. Each one of us must bring a gross or delicious Halloween dish. Clearly, I am going for the gross (but may end up being both, huh?). This recipe is very apropos as all of the guests as well as the hostess are involved in farming of some sort. I will post pics. I have everything you have recommended except for the Telephone brand agar agar. I cannot get that brand in time. Hopefully, another brand will suffice. Thank you again for the idea and recipe. Pics and report to follow. Yeah! My husband drove more than an hour away to get me the Telephone brand. My eyes are in the fridge as we speak. Thank you again for the recipe. Will post pics tomorrow. So hope mine turn out well. Looking forward to showing them to everyone tonight. Lori, your husband sounds like an awesome guy! I hope you will come back here and let me know how they go! Enjoy and happy Halloween! So spooky fun and super creative!!! These look incredible! What is the red sauce you used when you plated? I’d like to duplicate, start to finish. Elena, it’s actually just a smear of red gel food coloring, it wouldn’t be tasty at all! BUT I think you could make a puree with strawberry or raspberry and sugar and cook it down and then use at as an accompanying sauce. Something like my zombie drink recipe would be perfect, I think. Check it out here https://www.squirrelsofafeather.com/zombie-gore-guzzlers/. How long do these last refrigerated? That is an interesting question, Rachel. Ours never last long enough to worry about it and I scoured the internet for an answer for you only to come up empty-handed. I would say it should last in a properly cool refrigerator at least 3 days safely, stored in an airtight container. After that, start checking for weird smells and textures. My motto is, if it doesn’t smell right, don’t eat it! Can I substitute corn starch for the agar agar? I can not find agar agar locally and I did not leave myself enough time to order it online. Amanda, do not use cornstarch! It will not be the correct texture and the taste will be horrid! If you don’t have time to get agar agar, you can try using the non-colored gelatin from the supermarket instead. 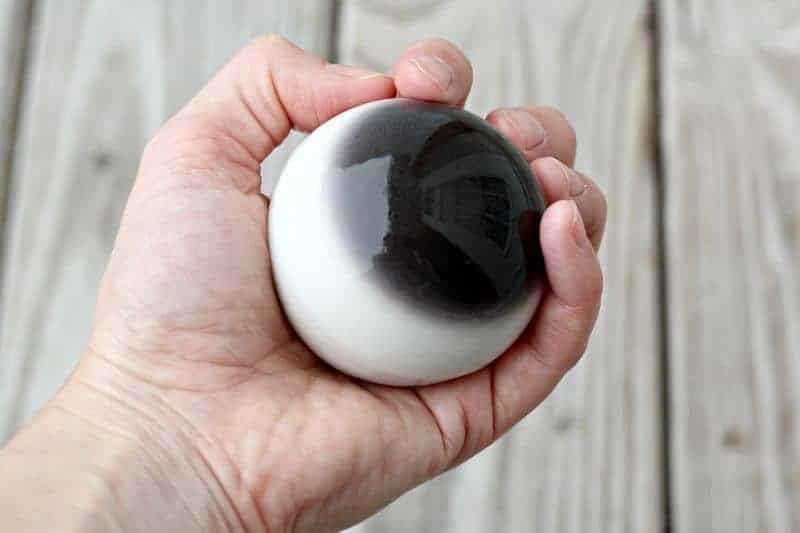 There are plenty of Jell-O eyeball recipes on Pinterest, just follow their ingredient instructions and then use my trick for getting the black iris and white eye. Hope you find something that works! Love the eyeballs! Is there a smaller spherical mold that could be used and where is the best place to purchase agar agar? I would love to make 40 for a Halloween dinner! Thanks for the recipe! 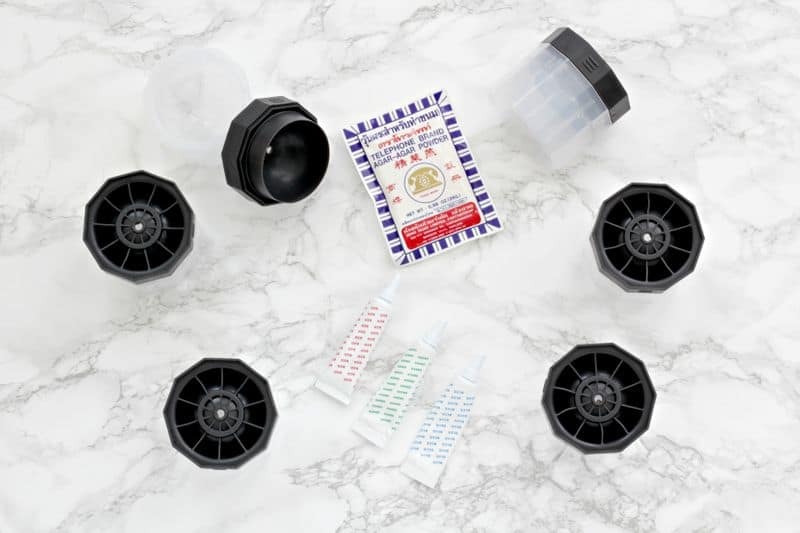 Janet, I went hunting around and didn’t really find anything smaller that I could recommend…I can say definitively NOT to buy the kind that comes in trays because they don’t work well (like this one, for reference – def not recommended – https://www.amazon.com/Ankway-Release-Silicone-Reusable-Cocktails/dp/B01G5CU2S6/ref=sr_1_78?ie=UTF8&qid=1540503988&sr=8-78&keywords=sphere+mold). Maybe look elsewhere in specialty shops? As for the agar agar, you can use the link above to purchase online or you can buy from your local Asian market. Make sure you DO NOT buy Gold Coin brand – Telephone brand is the kind I like! Ok so I made these today for a Halloween party tomorrow… they turned out amazing! I followed your recipe exactly… I only made 6-i have three Halloween parties to go to this week. So how did you display them? Anyway-thanks for the great recipe idea!! I think they look dramatic plated on a dark plate or bowl (contrasting with the white of the eyeballs). Having a small lip to the container helps, so they don’t roll around when transporting them. If you want to get REALLY gross you could dye some spaghetti red and nest the eyeballs in a bed of stringy “muscles and flesh”. Depends on how spooky you want to get. 🙂 I hope everyone loves them! That’s one tiny hole in the top of the mold. Do you have any trick to pouring the liquid in? They ARE small — but you don’t need to worry about that! The way that these are designed is ingenious; you simply fill up the bottom of the mold and then CAREFULLY put the lid on. The silicone sides of the lid mold push the liquid up, so that it fills the top part of the mold. The hole is actually just for the air to escape! You are left with beautiful, no hassle spheres! Hope I explained that ok! Sweet! I’m making these tonight! Awesome, hope you love them! They are perfect! I only made six and used the extra to make a little green dinosaur in a cute pan that I have. This stuff has endless possibilities! I’m so glad they turned out well for you, Sarah! I remember you said you were going to make them. The dinosaur sounds too cute, I agree — agar agar is fun stuff to play with! Happy Halloween! Do you know if cream would work? I’m not big on the coconut. Other than that they look amazing!!!!! Heather, I am thinking that they might have slid off because you cooled the white part too much before adding it to the mold. I didn’t know that would happen, but it makes sense…if it is still hot, the white will slightly melt the black and “fuse” them together a bit more. Does that seem like it might have been the case? If so, I will make a note of it in the recipe. As for the cream, I could see it working…as long as it tastes good as a liquid in the pot, it will taste good when it solidifies! Make sure it’s flavored and sweetened exactly as you like it before putting it into the mold and you should be good! Yep, you can make it any shape you want! It will be like a very stiff pudding. Half spheres are easier than full spheres, in fact. Thanks! I can’t wait to try. Just need to find the right agar agar here in Denmark – I don’t think I ever even worked with the animal gelatine before I turned plantbased. I have had so much fun with weird plantbased stuff I never heard of before, and this will be a totally new one 🙂 So many riches and inspiration – thanks again! Cooking has become an adventure and pure fun!